Ever wonder what the most popular web searches are for any given day or what has been trending? Google Trends is a site that will give you an idea of how popular a particular search has been. As an example, click here for a 12-month view of what the trend line for searches on ‘Rapture’ looks like. As of the date of this post, Ghana, Nigeria and Zambia are the top countries for which searches on the Rapture have originated. Makes one wonder what is happening there. It’s also clear that interest in the subject spiked sharply right around the date of the September 23, 2017 Revelation 12 Sign. Can you be saved after the rapture? What happens after the rapture? Where is the rapture mentioned in the Bible? What’s the Big Deal about September 23rd 2017? A summary of what I find to be most interesting about the latest “Jesus is Coming Back Soon” movement. I can’t help it, I’m fascinated by this stuff. It’s challenging to accurately define this phenomenon of excitement and controversy which surrounds an upcoming astronomical alignment that involves the Sun, Moon, and Stars. Is it a movement? I don’t like that choice of word, but I’m unable to think of a better word to describe it. Here is a bullet list of what makes this so different from the list of other failed predictions of when Jesus would be returning. 2. The alignment does happen on Feast of Trumpets, which is the ‘appointed time’ or ‘holy feast day’ most commonly associated with the Rapture of the Church. Jesus is a Jew. The Jews observe the beginning of the new day at Sunset, not Sunrise. Feast of Trumpets is celebrated for two days. From sunset 9/21 to sunset 9/23 equals two days. The alignment is happening all day on 9/23. 3. There is no single charismatic teacher or leader or 'prophet' who is responsible for the narrative surrounding the Revelation 12 Sign which has developed over the course of the last three or four years. 4. Unlike all other ‘predictions’, this was not derived by someone’s unique method of calculation using Biblical dates and date spans. 5. The alignment of the Sun, Moon and Stars on this date has been pre-determined since Creation. 6. The ability for the everyday people like you and me to even know that this alignment would be happening on this date has only been around for a little more than 10 years, due in large part to the Internet developing into a global distribution channel for not just ideas and information, but for amazing tools like the Stellarium astronomy software. Knowledge has increased. 7. Despite what some critics say, this has nothing to do with Astrology which is fortune telling, it’s more accurately defined as Biblical Astronomy which is supported by over a hundred verses from the Bible, but most people don’t read the Bible often enough to know that, and it is a rather thick book so it takes a determined effort to pull information on a specific topic. Thanks again to tools on the Internet like BlueLetterBible.org it’s much easier than it used to be. Knowledge has increased. 8. The topic is incredibly divisive. For many people, it is too difficult a thing to objectively investigate the claims and not allow their emotions to influence their opinions. This only peaks my curiosity in the matter that much more. 9. Despite what some critics say, there hasn’t been an astronomical alignment as similar to this one since August 5th, -3915 B.C. … that’s almost 6,000 years ago, so yes, you could say it’s pretty rare. 10. The symbolism attributed to the elements of this alignment is rather amazing. a. Virgo the Virgin is the first sign in the Mazzaroth (the Biblical equivalent of the zodiac); so Virgo is the Alef or the Alpha in the Mazzaroth. Jesus came into the world through Mary, the Blessed Virgin. b. Leo is the last sign in the Mazzaroth; Leo is the Tav or the Omega in the Mazzaroth. Jesus will return to the world as the righteous, conquering Messiah, the Lion of Judah. c. The planet Jupiter is known by many cultures as ‘The King Planet’. e. The physical appearance of Tzedeq or Jupiter matches Isaiah 53; stripes, a pierced side, and even a crown of thorns as represented by the aurora borealis electrical storm. f. Beginning in November of 2016, Tzedeq or Jupiter went into retrograde within Virgo’s womb area for a period of a total of 9 months, 2 weeks and 6 days before beginning to exit from between her legs on 9/10/2017 . This period of time is equivalent to normal gestation for a human child. Retrograde is an astronomy term used to describe the apparent back and forth movement of a planet when it appears to not be continuing it’s path across the sky. g. The brightest star in the constellation Leo is named Regulus, which means ‘The King Maker’, and was part of a conjunction on Sept. 11th, 3 B.C. involving Jupiter which would have made for the brightest object ever seen in the night skies. Bethlehem Star anybody? i. Jesus described Himself as “The Bright Morning Star” in Revelation 22:16. The planet Venus is known as ‘the morning star’. On September 23, the day begins with Venus rising above the eastern horizon before sunrise in the constellation Leo, leading the way for the rest of the Revelation 12 Sign alignment until sunset, as the day changes from today to tomorrow. No one knows the day or the hour. 12. The Blood Moons. I won’t go into detail in this article…but a connection has been made between the interval of days between each Blood Moon and 09/23/2017 that defies all probabilities. 13. Incidental Date Spans : I won’t go into detail in this article …but after the discovery of the Revelation 12 Sign, date spans of 120, 100, 70, and 50 years exactly have been identified as being related to how a Biblical generation is defined, and Jubilee years. 14. A new corporate ‘born again’ theory …I won’t go into detail in this article, but a new view of what it means for the corporate Church (the body) to be ‘born again’ has developed which makes a lot of sense. 15. Take a look at how Isaiah 66 dovetails with the depiction of the woman giving birth in Revelation 12… how unusual that the woman gives birth BEFORE her labor pains (Tribulation). Who has ever heard of such a thing? This verse is being looked at in a new way, as a picture of the Church being born from Israel before the Tribulation begins. Focus on the word ‘goyim’ in the original Hebrew. Who are the goyim? Aren't they everybody but the Jews? Q: will September 23, 2017 be the ‘End of the World’ ? Q: Will the Church be Raptured on or around that day? A: I really don’t know. Q: Is this Revelation 12 stuff really worthy of so much attention? A: Because of how different it is, I think it’s worth serious, objective consideration. Q: Is it possible Sept. 23rd will come and go and nothing at all will happen? A: Yes … but "What if… What if they are right this time?" Because that day is coming and it's closer than it ever has been. When searching for TRUTH, no matter what the topic is, one must remain objective and consider all possibilities without allowing one’s pre-existing prejudices, pre-conceptions and bias to potentially steer the investigation in the wrong direction leading to false conclusions. This approach applies equally to science, criminal investigations and even riddles. It’s possible that you haven’t yet heard, or haven’t heard much about it, but hundreds of thousands of people already know that something very specific is going to happen next week which could affect you, me and everyone else on the planet. I say ‘could’ affect because I don’t know for sure, but as someone who is searching for truth I need to remain committed to objectivity and consider that the possibility exists. However, as I stated yesterday, just because a large group of people believe something to be true, it doesn’t make it true…it either is or it is not. In this case, the size of the group is relatively small, even if the number in the hundreds of thousands, but the arguments and reasoning behind their theory or interpretations are solid enough that they shouldn’t be simply laughed off or casually dismissed… to do so might be considered the folly of half-hearted truth seeker. Is Jesus coming back soon? I can almost hear some of you laughing right now. Regardless, many people think so, perhaps more than ever. Some people don't care. Some people question whether He ever existed, or say that if He did, He was just a man, and a “good teacher”. The Bible, which is a collection of 66 different books penned by 40 different authors, quotes Jesus as saying that there would be signs in the sky involving the Sun, Moon and Stars which would herald His return in the Last Days (see Luke 21). As an example, let’s recall the story from over 2,000 years ago which tells of a bright star in the sky which the wise men in the east followed as a sign of the birth of a new king, the baby Jesus. With the aid of a free but rather amazing astronomy software package called Stellarium, we now know that this star was most likely the conjunction of Jupiter and Regulus, the brightest star in the constellation Leo on September 11, 3 B.C. This conjunction would have been the brightest object ever seen in they sky ever since. "Now a great sign appeared in heaven: a woman clothed with the sun, with the moon under her feet, and on her head a garland of twelve stars. Then being with child, she cried out in labor and in pain to give birth. And another sign appeared in heaven: behold, a great, fiery red dragon having seven heads and ten horns, and seven diadems on his heads. His tail drew a third of the stars of heaven and threw them to the earth. And the dragon stood before the woman who was ready to give birth, to devour her Child as soon as it was born. She bore a male Child who was to rule all nations with a rod of iron. And her Child was caught up to God and His throne. Then the woman fled into the wilderness, where she has a place prepared by God, that they should feed her there one thousand two hundred and sixty days." For the last three years I’ve been fascinated by the developing story behind the upcoming Revelation 12 Sign and have found myself drawn to it like a moth to a flame. Hands down it’s the most divisive yet compelling theory behind the return of Jesus that I’ve ever encountered. And for the record, I've never been the least bit swayed by any of the previous predictions. The Revelation 12 Sign is so divisive that it causes some Christians and non-Christians alike to become quite defensive or angry if it is even mentioned as something that might be worthy of a closer look, or objective investigation. This only stokes the fire of my curiosity even more. History is full of failed predictions of Jesus’ return. Perhaps it’s true that after each failure, people may become increasingly weary, skeptical or mocking towards any new predictions. Whether or not these reactions are preventable is a topic for another day. The Second event occurs after the Rapture and after a troubling period of seven years, at which point Jesus returns in what is commonly known as ‘The Second Coming’. Some believe that the upcoming astronomical alignment on Sept. 23, 2017 will be a fulfillment of the ‘Great Sign’ described in Revelation 12. 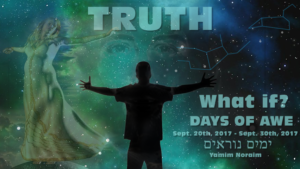 They also believe that a window of opportunity for the Rapture begins on the first day of the Jewish High Holy Day known as Feast of Trumpets, which is next September 21st and happens to coincide with the Jewish new year, Rosh Hashanah. A few believe that the window could even be extended up to Yom Kippur or the Day of Atonement on September 30th. This all happens during the Jewish month of Tishrei which has the theme of Repentance, or turning back to God. The Jews call the time between Feast of Trumpets (Rosh Hashanah) and the Day of Atonement ‘The Days of Awe’ or ‘The Ten Days of Repentance’. But what happens if there is no significant event between Sept. 21st and Sept. 30th? Disappointment? Confusion? Depression? Heightened resolve to keep trying to figure it out? Ridicule? BUT WHAT IF…WHAT IF THIS TIME THEY ARE RIGHT? For most Christians, the belief that Jesus will eventually return is a given. 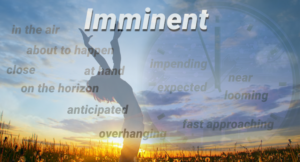 However, there are three main diverging theories on the timing of the Rapture in relation to the Tribulation, which once again are those last seven years of hell on earth before The Second Coming of Jesus Christ, when He returns to set things right. To those Christians who subscribe to a Pre-Tribulation timing of the Rapture, it will probably be an ordinary day like any other. The sun might be shining, the sky might be blue. And then in an instant, in the blink an eye, a trumpet will blast from above and it’ll be over…all of the true believers in Jesus will have instantly disappeared, having been ‘caught up’ to Heaven by Jesus Himself. 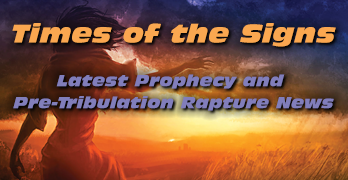 The Rapture event is thought to kick off the beginning of The Tribulation, aka The Time of Jacob’s Trouble, or Daniel’s 70th Week in which the earth which will be the object of God’s wrath as evil is allowed to dominate, but only for a short time. And what of those left behind? Most will die. Many will wish for death. It is described as being the most horrible time in the entire history of the planet. Yes, yes, yes, I know… there have always been wars and earthquakes and eclipses and hurricanes and such. But what is different this time is the apparent convergence or increased intensity and frequency of these events, which are all happening 70 years after the re-establishment of Israel as nation, which has always been viewed as the last key prerequisite to Jesus’ return. The most common response from dissenting Christians is “No man knows the day or the hour!” of Jesus' return, quoting Matthew 24:36. How unusual though for Jesus to have given so many signs to watch for in advance of His return for His Church. In response, the Christian dissenters who reflexively respond, “No man knows the day or the hour!” will certainly also say, “You can know the season but not the day or the hour!” Perhaps. Then again, an objective investigation should consider the possibility that the verse about not knowing the day or hour may have been misunderstood. Perhaps, just as the prophet Daniel was instructed in Daniel 12:4, the meaning and understanding of the prophecies has been sealed UNTIL the Last Days, which certainly seem to be upon us now. This would logically imply that any purported understanding of the prophecies BEFORE the Last Days would have to be flawed to some degree, if not entirely incorrect. 1. Are the prophecies being UNSEALED now? 2. 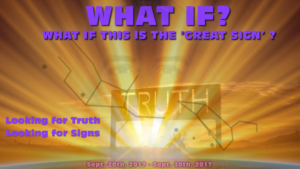 Is the upcoming astronomical alignment on September 23rd actually the ‘Great Sign’ described in Revelation 12:1 ? 3. If not, what could the Great Sign in Rev. 12 possibly refer to? 4. If it is the ‘Great Sign’, does it relate to the Rapture? and in my next post I’ll share some of the valid arguments both for and against the idea of how this upcoming astronomical alignment could be the ‘Great Sign’ of Revelation 12. What Percentage of Israel is Christian? Christians currently make up just 2% of Israel’s adult population. So this is rather significant when considering the Rapture…Israel will hardly be affected should 1% or 2% of it's population be caught up to heaven. Numbers wise, this would be somewhere around 80,000 to 150,000 people total. In comparision, according to a 2014 study by the Pew Research Center, 3% of the adult population of the United States identified themselves as Jewish, 70.6% of the adult population of the United States identified themselves as Christians, with 46.5% professing attendance at a variety of churches that could be considered Protestant, and 20.8% professing Roman Catholic beliefs. Even if only 1/2 of those who identify as themselves as Christians are caught up to heaven, that would be 35% of the entire population of the United States, or over 100 million people. The country would essentially cease to exist and would instantly transform from a land of law and order to disorder, or chaos or anarchy. 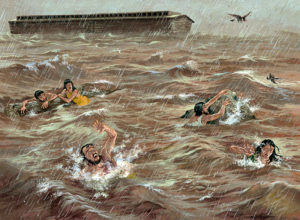 This morning the picture that’s stuck in my mind is what it must have been like when the doors were shut to Noah’s Ark. The chosen were invited in at the right time and saved from God’s wrath. All the others who were left behind must have experienced confusion, intense fear, panic, and possibly regret before they died, mostly by drowning as the waters quickly rose and violent torrents of mud and debris swept people away like the Christmas Tsunami of 2004. In his mercy, God’s wrath will not be fully unleashed again until half way through the Tribulation Week, at the 3 1/2 year mark. The first half of this period is marked by a false, non-lasting peace under the reign of the world’s new ruler and is an opportunity for people to come to a saving knowledge of Jesus so they can face death boldly and confidently that no matter what, Jesus is there for them, forever. Soon, at the right time, the trumpet will sound and doors of Heaven will be open for God’s chosen to enter in, to be sheltered in safety from the coming storm like Noah and his family. The doors will open for a fraction of a second, in the twinkling of an eye. Then the doors will shut. Since everything will be destroyed in this way, what kind of people ought you to be? You ought to live holy and godly lives as you look forward to the day of God and speed its coming.That day will bring about the destruction of the heavens by fire, and the elements will melt in the heat. But in keeping with his promise we are looking forward to a new heaven and a new earth, the home of righteousness. Up to a point, God’s judgement is His mercy, but many people don’t see it that way. What I mean is that God is long suffering or very patient with people. Many times God has used judgement in the form of death, famine, natural disasters, or attacks from the enemy to get the attention of His people and motivate them to acknowledge His existence and cry out to Him. In His righteous anger God could very easily wipe out all mankind, but His love for His creation overides the requirements of the Law, … this is mercy. However, for every mortal there comes a point in time or in their life where they run out of second chances to repent or turn to God and live their lives according to His ways. The body of Jesus Christ was risen as a new, incorruptible, glorified body early on the 3rd Day. So it will be with the Body of Christ today, which is the Church. On the 3rd day the body, that is the church of true believers, will be given new incorruptible bodies and will rise to meet Christ in the air. The Rapture is nearer than ever, but do not give any attention to anyone who says they know the day or the hour, because God’s Word says no one, not even the angels, know what the day or the hour is….but its near. I believe that the 3rd day has already begun. on the third day he will restore us, that we may live in his presence. 2000 years since Christ is right about now. *365.2425 days is the same as our modern Gregorian calendar. If Christ was born around 4 B.C. then it would have been around 30 A.D. when he died at on the cross and rose from the grave at the age of 33. Now don’t misunderstand me, this is not a date-setting false prophecy, its just an illustration using scripture and simple math to point out why I believe Jesus is coming back VERY SOON. Obviously I am not saying that Jesus was to come in 2001 (which has come and gone) but it could be anytime now, the Lord will not tarry. Come, let us return to the LORD. He has torn us to pieces but he will heal us; he has injured us but he will bind up our wounds. After two days he will revive us; on the third day he will restore us, that we may live in his presence. 0-1000 A.D. 1001-2000 A.D. 2001-3000 A.D.
Its interesting to note that Rosh Hashanah or the Jewish New Year is in September. We all know what happened in September 2001. Remember Y2K? Remember how many people mistakingly believed that the year 2000 was the beginning of the new millennium when in fact it is the year 2001? Is it too much for coincidence that the math outlined above coincides with the awful events of September 11th 2001? When I think about the photos of Satan’s face appearing in the cloud of smoke emanating from the Twin Towers it doesn’t seem so surprising. These are the times of the signs for sure. Since I was a kid, the commonly accepted understanding was that China would be the source of the vast army which would invade the Middle East. However, in light of current events involving Islam, this understanding may not have been correct. The origin of the Euphrates River is in Turkey, runs through Syria, Iraq to the Persian Gulf. I’m thinking both may be partially correct; that this involves Turkey and a crossing of the Euphrates River. Drawing a longitudinal line on a map from the headwaters of the Euphrates River in Turkey does put Turkey, Syria, Jordan and Iraq on the ‘East’ side of the line. Just a thought. This is not the 'letter from the editor' that I intended to write. Due to the circumstances of recent days which have literally changed the world, I feel a strong urgency and leading from the Lord to simply write my thoughts at this time. In summary, September 11, 2001 was the most horrific day in the history of the United States of America to date. The projected estimate of how many people have died in the terrorist attack on the World Trade Center is now 6,300. This does not include the hundreds who died in the downed airliners or in the Pentagon attack. This all seems so unreal, but it is happening. There is no turning back to the life we knew before the events of Sept. 11th. My greatest hope is that a multitude of people throughout the world begin to cry out to the true living God before its too late. Another hope is that web sites like this will be found by those who are seeking the Truth. Jesus Christ is coming soon to take his 'church' away from this world in an event known as The Rapture. His church is not a building, but all those people who believe in Him and who call him Lord, who are "counted worthy to escape". Who knows?…, maybe by the time you're reading this it will have already happened. I would expect that immediately after the Rapture the world will find itself in a state of panic and chaos. Many people who have been left behind will instantly become believers, but it will be too late, their fate will be to experience some or all of the Tribulation which is comprised of the last 7 years on Earth before Jesus returns to destroy his enemies and rule on earth for 1000 years. Its all laid out clearly in the last book of the Bible called 'Revelation', which is about the revealing of Jesus Christ, our Lord and Savior. If the you're reading this and The Rapture hasn't happened yet, know this, The Lord can come at any moment. So live each moment of your life for God. Look up! Your Redeemer's return is near! Prepare yourselves to face God. Turn away and run away from sin. Cry out to the Lord right now to help you break free from the habitual sin that you've become entagled in and can't escape from on your own. Do not take 'the mark' which is placed in the hand or on the forehead when the day comes, even if having the mark is the only way to buy or sell. Trust God instead. If he feeds the little sparrow, he'll feed you as well. The number of the mark is the number of man 3 times, or 666. Acknowledge the name of the Lord.